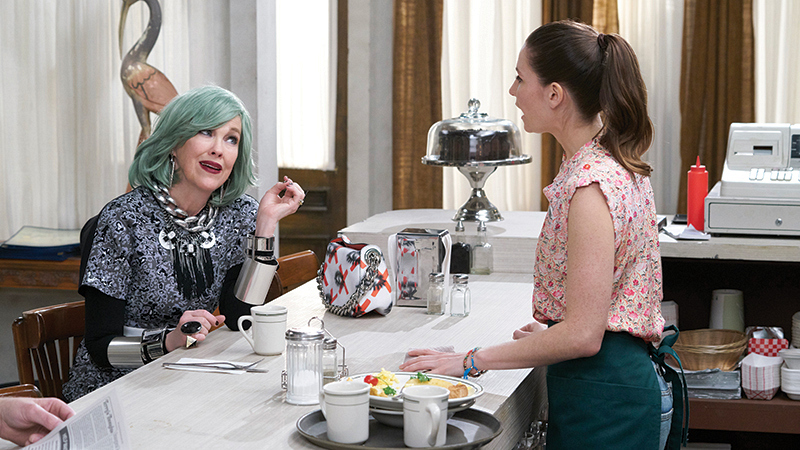 Binge-Watching Schitt's Creek Our columnist wades into Pop TV's hit series Schitt's Creek. One of my very favorite television genres is what I call "Rude Rich People" (RRP). RRP is essentially a subgroup of fish-out-of-water stories but with way better clothes, a lot of shade-throwing, and usually at least one British person. Or, in this case, multiple Canadians. 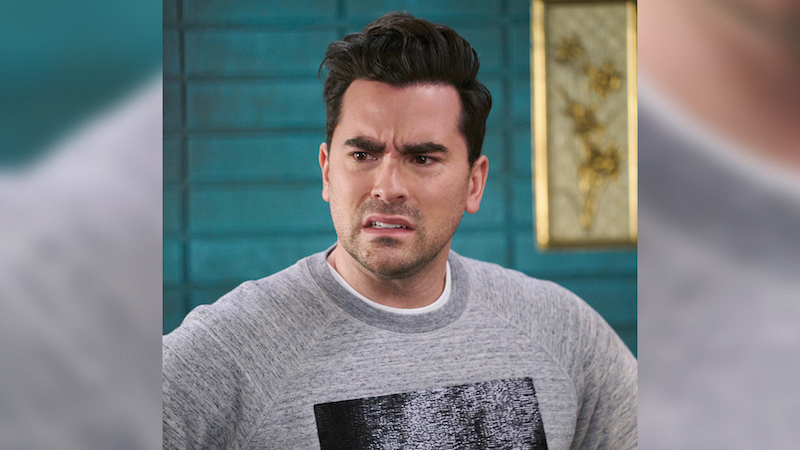 Schitt's Creek is RRP at its finest. 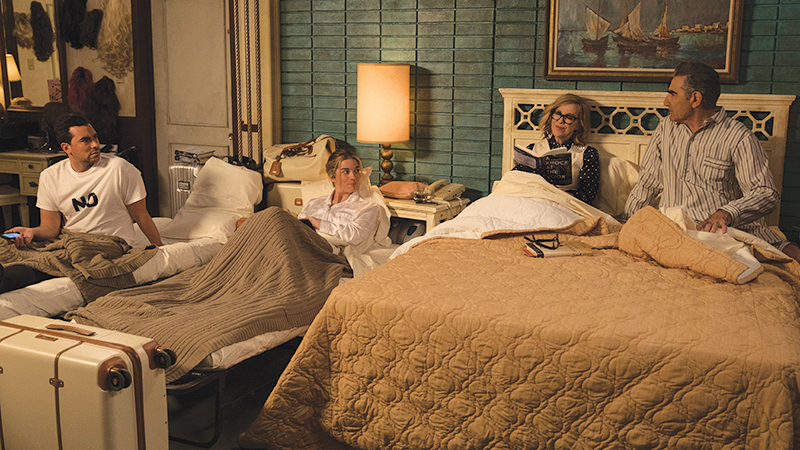 The show centers around the wealthy Rose family—comprised of patriarch Johnny (Eugene Levy), matriarch Moira (Catherine O'Hara), son David (Daniel Levy; yes, Eugene's actual son), and daughter Alexis (Annie Murphy)—who suddenly find themselves completely broke, aside from a singular remaining asset: a small town called... take your best guess. The Roses: David, Moira, Johnny, and Alexis Rose, a family sans the proverbial paddle. Thus the tuxedoed albacore (fancy fish) reluctantly swim out of their alkaline infinity pool (fancy water). The family moves into a seedy motel in a tiny creek-adjacent town and struggle to adapt to their impoverished new way of life. In an early episode, David sums up their situation quite nicely: "My sister texted me 'help' and my mind went straight to Deliverance, so I wasn't too far off." I am so on board with these RRPs. The bad news: They're stuck flying coach. The good news: Slumber party! I spend a large part of the first season researching how to make my eyebrows as thick as those of the Levy men. I really feel like they're missing out on a branding opportunity here, à la Kylie Jenner's lip kits, and I vow to drive to Canada, find Eugene and Daniel, and pitch them LevyBrows as soon as possible. And while we're talking (O')hair(a), Moira wears a different wig in each episode (sometimes each scene) and she outright SLAYS in every single one. Also, Alexis' statement headpieces are comedy gold. What I'm saying is that Lady Accessories (brows included) is the fifth member of the Rose family and she's really pulling her weight here. A velvet, feathered, wide-brimmed hat tip to you, madame. Not to talk only about the clothes in this show, but I am very overwhelmed by the sartorial fierceness being served on the reg by the Rose crew. Alexis' boho chic + Johnny's suits + Moira's sleepwear street style + David's Kanye-in-Japan ensembles = this binge watcher is in love. Which is ironic because I dress nothing like any of them and, now that I think about it, a whole lot like Stevie (Emily Hampshire), the motel co-owner who wears mostly genderless flannel. Know thy Schitt self, I guess. 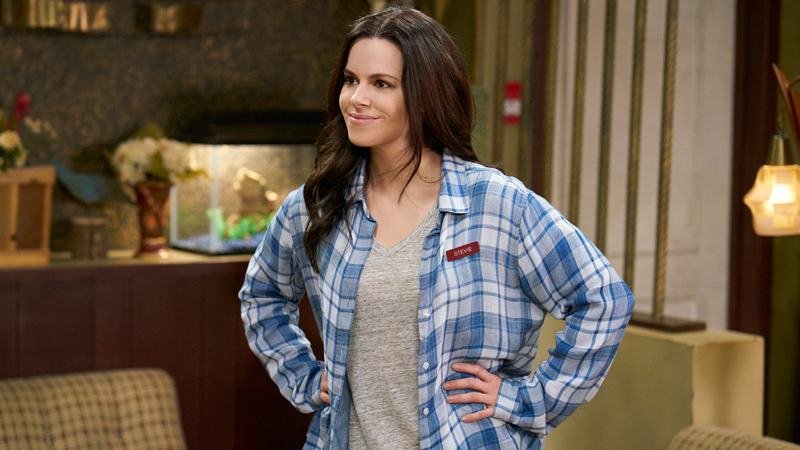 Schitt's Creek motel clerk Stevie Budd has a penchant for flannel wear. Speaking of Stevie, she and David initially have a will-they-or-won't-they thing, then they do it a couple times and are like "nahhh" and genuinely become best friends and date other people, and it is rather refreshing. Meanwhile, Alexis has been on-and-off with a guy named Mutt (Tim Rozon), whom I keep referring to in my notes as "Beardy," until he shaves his beard off and becomes "Not Beardy." Then he's gone for only a couple episodes and comes back with a full beard again, and as I was yesterday, I am blown away by how fast and strong the facial hair grows in Canada. Maybe it's the maple syrup? Should I put maple syrup on my eyebrows? Don't answer that. I've already slathered. Alexis' grand escape scheme: rich boyfriend to the rescue. I've cleared up my post-syrup forehead rash and I'm almost caught up on Season 4. The newest development is that I've found myself really identifying with David, to the point where I'm wondering if, while I'm Stevie on the outside, I'm truly David within? We have a mutual respect for board game rules, are similarly soothed by organizing our knits, hold a common unsubstantiated belief that our taste is the only taste, and both list our personal hell as watching improv. You, too, can convey emotional depths with... the LevyBrow! Also, he turned the town general store into the Goop-iest "apothecary" outside of Brentwood, and I want every overpriced tobacco-scented candle I see. Oh, and he's now dating a dreamy guy named Patrick (Noah Reid), and that has nothing to do with me except that it has to do with David so it has everything to do with me. It ain't the Metropolitan Opera, but singing is free! Meanwhile, the rest of the fam has settled into the Creek quite nicely: Johnny's helping run the motel (and keeping his suits crisp AF); Moira's joined an a cappella group and the town council (and has started rocking a pink wig that I am truly here for); Alexis finished high school, worked at a vet's office, dated said vet, and bade farewell to Beardy; and I (new member of the fam) have fought tirelessly to iron out a joke about these Roses not smelling like poo-poo. Because the name of the town is... and their last name is... never mind. What I'm trying to say is that this show is the Schitt. LevyBrows forever. Originally published in Watch! Magazine, July-August 2018. Photo Credits: Courtesy of Pop TV. 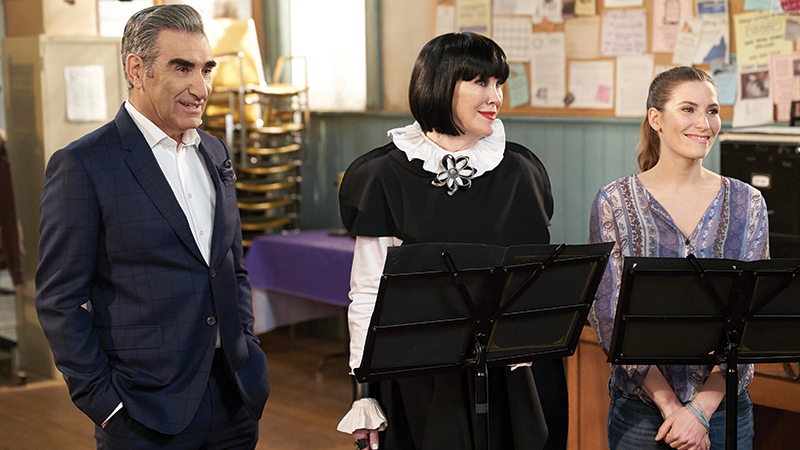 Stream full episodes of Schitt's Creek (Seasons 1-4) on Pop TV's website or enjoy via the Pop Now App.